Most of the Christian world observes Jesus’ death on the Friday before Resurrection Sunday. But according to the Bible, that dog won’t hunt! 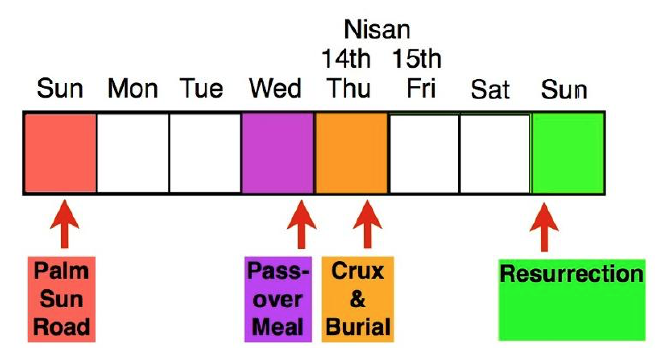 Most churches today teach that Friday is the day of Jesus’ death on the cross. This is an alternate view. (I actually think I’m Biblically correct but my wife thought I needed to soften my stance. Naturally, I worry if I soften my stance, don’t draw lines in the sand, I might turn into a democrat). First, it must be noted that the Bible gives us a detailed description of every day of Jesus’ last week prior to his crucifixion- VERY detailed. But there are only five days detailed in the Bible, instead of six. The missing day is referred to by Bible scholars as “The missing day.” LOL! Not much imagination there. It takes a lot of (guts, pride, ego, take your pick) to say there might be something left out of the Bible narrative. These Biblical “scholars” ASSUME that Jesus was crucified on Friday; therefore, there should be six days of details (Sunday through Friday). But only five are referenced in Scripture (Sunday through Thursday). 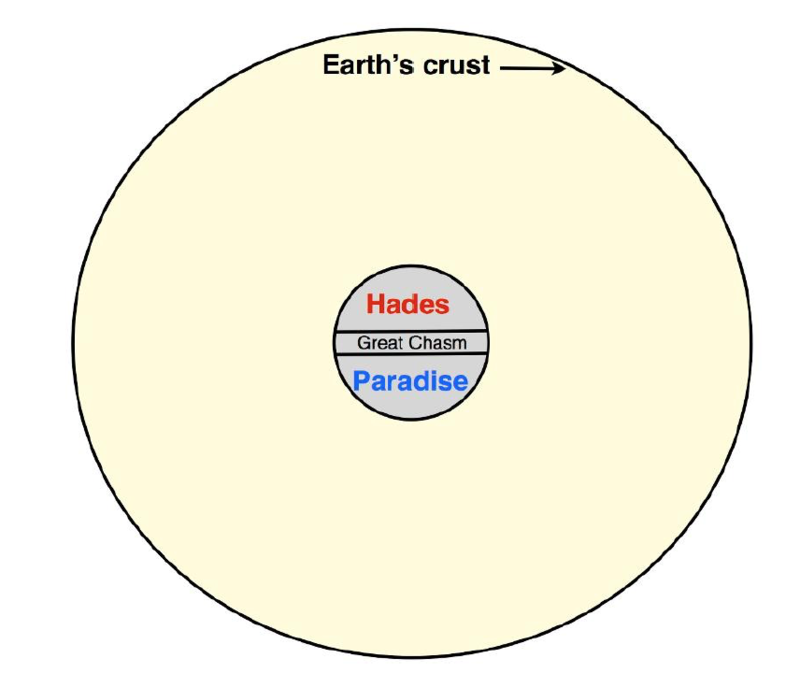 The “heart of the earth” is a reference to the “bottomless pit” in the center of the earth (Rev. 9:1,2). When you are in the heart of the earth, no matter which way you look, you’re looking up! The Old Testament Saints could not go to heaven when they died because Jesus had yet to pay for their sins. So they went to “Paradise” to wait for their sins to be paid in full. Today, post-cross, Church Age Believers go straight to heaven when they die (2 Cor 5:8). Luke 16:19-31 is not a parable but rather an actual description of the bottomless pit. At death, those O.T Saints who trusted by faith the future Messiah were enjoying paradise just a few feet from those who were wailing in the scorching flames of Hades. They were so close they could actually talk to each other across a “chasm” (v. 24-26). It’s interesting that when Jesus died and defeated death, the first thing He did was go to the Bottomless Pit to claim and release His O.T. Saints so they could go to heaven. 80,000 people at a football game can make a lot of noise, but that’s nothing compared to cheer that must have roared when Jesus made His appearance in Paradise to redeem the O.T. Saints. I’m hoping I get to see a replay of that one day! 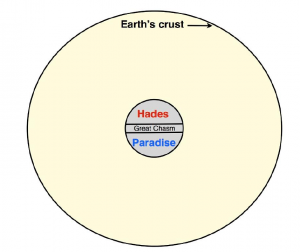 Apparently, as the redeemed Saints crossed through the earth’s crust on their way up, some lingered around and were seen by those alive on the earth. Eli: “That’s it? That’s all you have to do- TRUST? Your clothes aren’t received based on doing good works? Anyway I slice it, I can only get two nights between Friday and Sunday, even if I use a Jewish day beginning at sundown (sundown to sundown equals one day). It seems so much simpler just to follow the text as written and you have literally three days and three nights, as the scripture says. Now consider the verse regarding Jesus arriving at Lazarus’ house. We know that the latest Jesus could have arrived at Lazarus’ house would have been Friday before His Palm Sunday entry, because Saturday was Shabbat and He couldn’t travel. If you count six days from Friday, you come to Thursday, and the verse indicates that Passover began then. Passover lambs had to be slaughtered on the 14th of Nisan, which was Thursday that year. Jesus is called the Lamb of God (John 1:29). Jesus would not have been an acceptable sacrifice if He were sacrificed on any other day. So Passover would have begun on Wednesday night at sundown and His disciples would have had their Passover meal on Wednesday night, after dark. Thursday, He was crucified. It seems so much simpler to me to just follow the text as written and you end up with literally three days and three nights–as the scripture states! But, of course, what’s MOST important is not the day He died, but the fact that He defeated death and rose from the dead. On Sunday, three days and three nights after His crucifixion, He rose from the dead leaving an empty tomb. 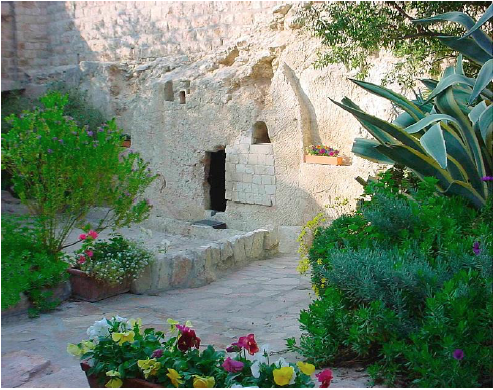 It gives me chills just thinking about the many times I’ve looked into that empty tomb in Jerusalem! If you would like to print this article click here: Was Jesus Crucified on Friday?